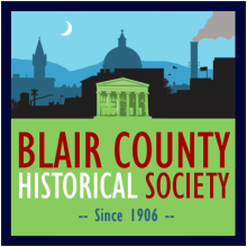 Welcome to the Blair County Historical Society! We are excited to offer seasonal events for 2019. Contact us via the information listed below to arrange your journey to the past! For over a century, the Blair County Historical Society at Baker Mansion in Altoona, PA has conveyed regional history and the story of the Elias Baker Family. Settling in the area in 1836, the Bakers became a very affluent family thanks to their rising dominance in iron-making during this time of rapid industrialization. Theirs is a story of ambition, perseverance, wealth, and power–all topics that retain great influence in modern society. Their story remains a highlight of our museum. At the same time, the Blair County Historical Society is equally dedicated in conveying a story broader and even more dramatic than that of a single family. The epic saga of Blair County, Pennsylvania is the tale of everyday people like you who were profoundly shaped by the powerful forces of community, nature, war, business, family, hate, and love. From Tyrone to Claysburg, local and national history was made by seemingly ordinary farmers, railroaders, doctors, lawyers, and teachers. The Baker Mansion History Museum seeks to interpret these common but extraordinary elements of our county through special events as well as exciting and thematic museum displays. The story of Blair County is the story of America itself. Come visit us and discover how. Special thanks to some of our partners! Contribute to our mission of historical excellence!